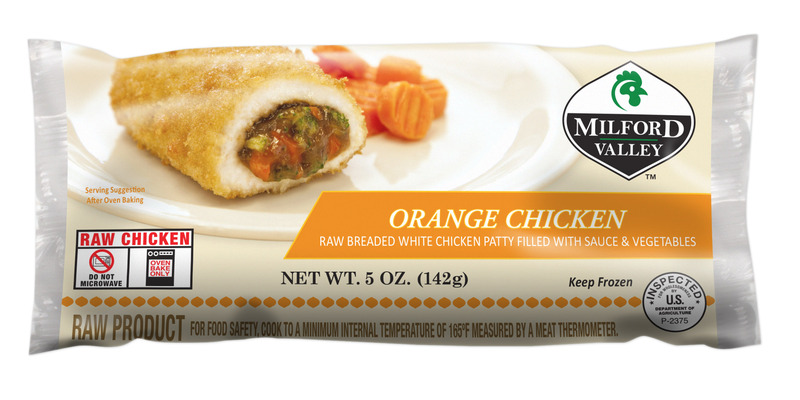 Asian-inspired flavor features breaded chicken breast stuffed with vegetables in orange sauce. Milford Valley Orange Chicken entrees are available in both 10 oz. (pictured) and 5 oz. package sizes. Stuffed Orange Chicken entrées are an easy way to enjoy a taste of the orient at home. 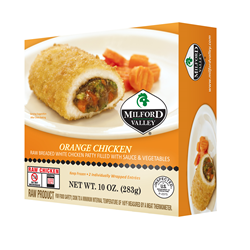 Milford Valley has developed a new Asian-inspired chicken entrée flavor for its retail chicken product line. The Orange Chicken entrée flavor features breaded white chicken breast filled with vegetables in a sweet and spicy orange sauce. The ready-to-cook chicken entrées are an easy way to enjoy a taste of the orient at home, and are affordably priced and easy to prepare in the oven. Clear cooking instructions on the package eliminates guesswork and helps to ensure food safety. Orange Chicken entrées are available frozen in two convenient retail package options for consumers: individually wrapped 5 oz. packages or in a 10 oz. two-pack box. Milford Valley chicken products are made at Serenade Foods in Milford, Indiana. Since 1976, the family owned company has manufactured chicken patties, chicken nuggets, chicken strips and stuffed chicken entrées for retail and foodservice markets. For more information, contact Milford Valley at 1-800-348-2812 or visit http://www.milfordvalley.com.